It’s that time again, the fifth annual Horizon Unlimited motorcycle event is being held at the Mariposa County Fairground. 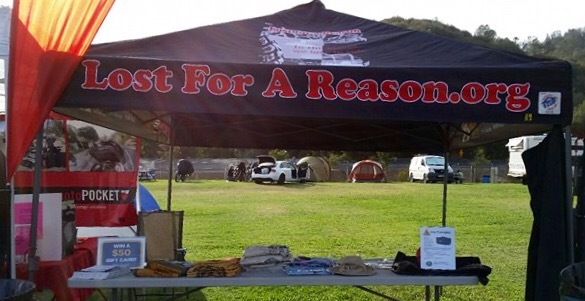 This year, I offered to volunteer on behalf of a charity organization called Lost for a Reason. When I registered for the event, I asked one of the organizer if they still needed presenters and of course she said that they still needed to fill some time slot. 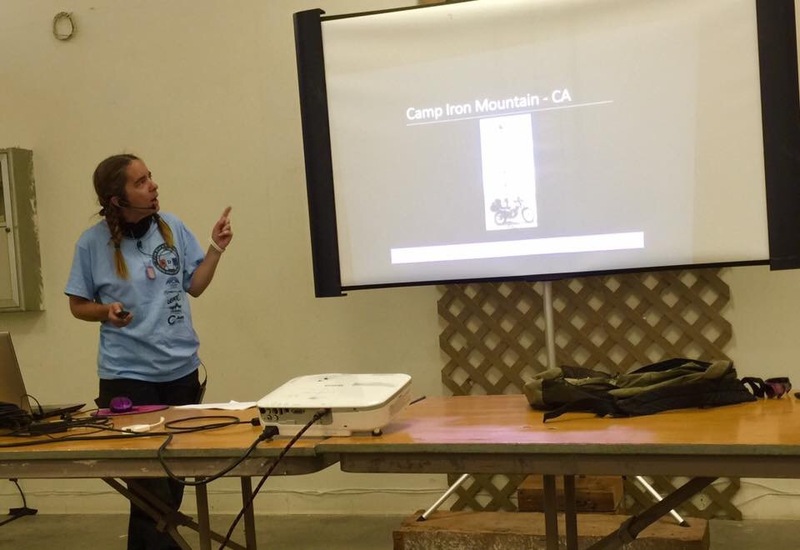 Thinking it was like Overland Expo event, I submitted several ideas but I didn’t realize that they would choose both topics I presented. Yikes, I had less than two weeks to get a new laptop and to look through over 2,000 pictures that I took on the trip to use in both presentations. The first hurdle I had to jump since I got back from the road was dealing with the bank. I went on a Sunday to buy the new laptop but my bank declined it. Uh? I know that I have enough money in my account so I was baffled as to why it would be declined. Since, it is a local credit union, I won’t be able to address the issue until Monday. Sigh, it has not been a smooth transition ever since I have gotten back home. After discussing it with the bank and which I have forgotten about is that I had them put a $500 dollar cap on all charges before I went on the road. So once I have cleared up that hurdle I went back and purchased the laptop and began the process of installing all of the necessary softwares which took several days. Then I could finally proceed with putting together the slide show for the two presentations. The first one was called “Roadside America – Unusual attractions, tourist traps, other oddities in the USA” This presentation was all about America obsession with quirky billboards and giant statues that still litter along the highway. The second presentation was about “Life Lesson from the Road” and was more emotional and harder for me to put to together. When I started this journey, I wanted to share experiences, strength and hope but it is I who ended up learning more about herself. Plus when looking through the all of the pictures, I discovered that it was mostly that the people I met along way who gave me experiences, strength and hope. Whew, I finished working on my slide show presentation the day before I needed to hit the road to Horizon Unlimited. Last year, I took a scenic route up there but since Purple is drinking oil a little bit too much for my taste, so I decided that this year, I would take the most direct route up there. Part of it is on Highway 58, which I finally stopped at a museum that I have been wanting to visit probably a million times since this is the same route I used to take to go to the Corporate office who I used to work for. The museum is in a small town call Boron which is home to the U.S. Borax Boron Mine, California’s largest open-pit mine, which is also the largest borax mine in the world. 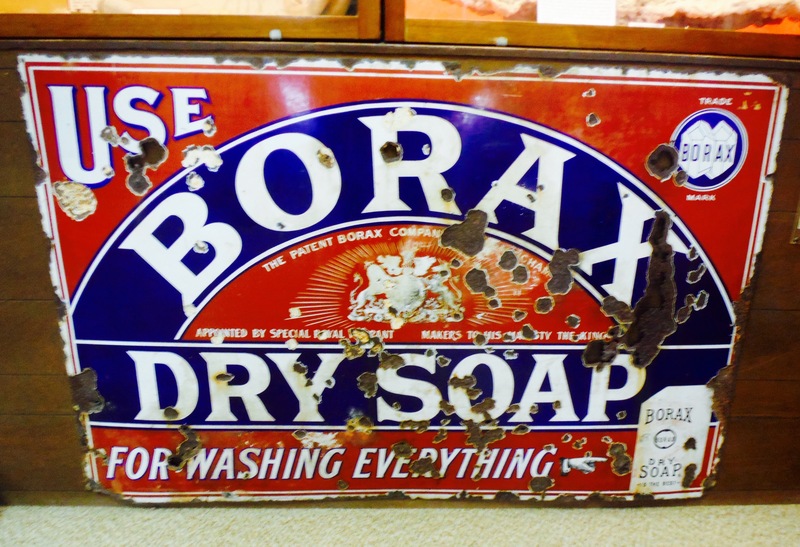 Back in the old days, the borax was hauled out of there via a Twenty-mule teams. They were teams of eighteen mules and two horses attached to large wagons that traveled from Death Valley across the Mojave Desert to the nearest railroad spur, 165 miles (275 km) away in Mojave, California. There were miniature version of the twenty-mule team and other artifacts about the mining life in Boron. I got an unexpected surprise when I stopped to visit the Twenty-Mule Museum, there was another museum next door. 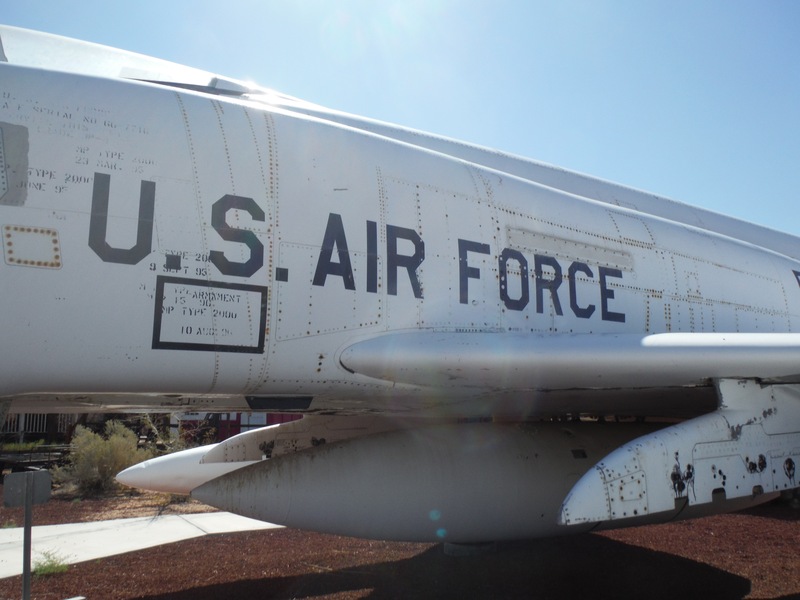 The Saxon Aerospace museum displays a collection of artifacts from the Edwards Air Force Base which is famous for its role in flight research and test pilot heroics such as Chuck Yeager. Since the event was over 300 miles away and I typically only go about 150 miles per day when I’m traveling, I stayed the night in a small town called Porterville and hit the road early the next day so I can make it in time for my 2 p.m. presentation. Only twenty-eight miles out, my chain broke again. Sigh, I seem cursed when I head to this event. You may remember last year on my way home, I broke the throttle cable and had to camp out in the middle of a blizzard. Before I hunkered down to work on the chain to see what broke, I decided to call AAA just in case knowing that it usually take anywhere from thirty minutes to an hour for them to show up. It’s a good thing that I did, as I took the chain guard off and tried to wiggle the chain out of the bike, I noticed that it is wrapped up in the motor near the front sprocket. This is not a good sign! So it is a good thing that I already called AAA. Wow, they showed up in less than thirty minutes and I got two of them to show up at the same time. I guess they got excited when they heard over the radio that a female motorcycle rider is broken down on the side of the road. 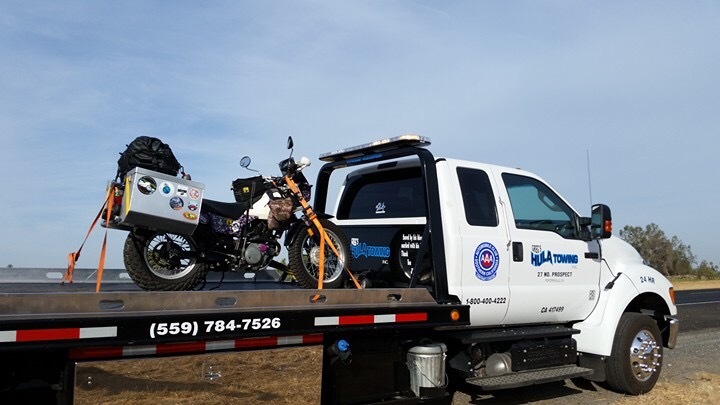 After looking at my bike and reading where AAA wanted them to take my bike, they decided it would be better to take me to a Yamaha dealer forty-five miles away instead. When we arrived at the dealer, they were able to work on it right away and the progress was not looking good since they had to take the side cover off and cut the chain out since it was wrapped up several times around the front sprocket. We didn’t know what the condition of the sprocket would be in and they didn’t have one on hand. However, they could get one within the same day if needed to. I was probably the worst customer they had since was pacing back and forth in front of the garage and looking at my watch calculating to see what the latest time I had to leave in order to make it in time to my presentation. Well, I got the good news about thirty minutes I had to be on the road that the sprocket is in fair and should hold up until I get back home. As soon as Purple was put back together, I jumped up on her and rode her for two and half hour straight to get the event with ten minutes to spare, whew! Horrah!! Wow, what a ride! Well done and well recovered! Yikes, chain! Don’t do that to GinaMarie and Purple again, ok?!? Always an adventure, though. I am very glad you made it in time!